As the days get longer and temperatures begin to climb (finally), comes the urge to throw on some sandals and a skirt to put our best body forward. But while we are all very excited about spring, you may have noticed the winter has left your skin looking dull, dry, rough, and even wrinkled. Knees, elbows, heels, and toes particularly suffered and are definitely not ready to show off in better weather. So, after battling months of harsh weather, our skin is in need of a beauty revamp before we can show some flesh. The question is: What to change right now to get our body ready for spring? Below are a few guidelines on how to build a new skincare regimen for the body. to help you bounce your way into spring! Winter can cause season-long build-up on the skin. This can consist of dead skin cells, leftover product, and environmental toxins. Plus, as we age the cells become less cohesive and the natural exfoliation process and cellular regeneration slow down, so the skin needs a little helping hand to get rid of any dry, rough layers left over from the winter. If you’ve grown a winter coat, you may be facing a major de-fuzzing come spring and summer. Among the best things you can do for your skin is a full-body exfoliation between 24 hours to 48 hours prior to having a waxing or chemical hair removal treatment. Not only it will facilitate your hair removal, but it will also help avoid the ingrown hairs scenario. Body exfoliation is also a great way to get ready for an application of any tanning product, to help to ensure a more even application with less streaking. Exfoliation is therefore key to achieving a sleeker, satiny smooth body — with or without an applied tan. The Lotion P50 Corps, with its high concentration of antioxidants and vitamins, purifies, balances, hydrates and protects your skin. An essential retexturising product which removes the old dead, winter skin, smooths away rough patches, and leaves your skin soft and glowing. 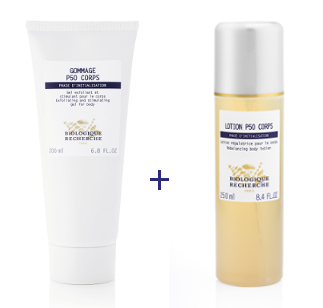 The Gommage P50 Corps combines acid and manual exfoliation for a gentle scrub that will not irritate or tear the skin. This exfoliator stimulates the epidermal functions by optimising cell renewal and leaves the skin toned and revitalised. For many of us, Easter is a time of overindulgence and we are now embarking on our beach body countdown… But cutting out the bad stuff won’t cut it. A complete detox programme is necessary to get your body back into shape in no time, and skincare can help. The Huile Sous-Ombilicale helps to eliminate toxins and excess water, reduces bloatedness and soothes the stomach and leg areas. This tummy tonic contains cedar wood, juniper, pine and clove essential oils to stimulate the belly area and reduce oedema. Bye-bye Easter stomach ache! The Lipogen AC is an oil which visibly improves the “orange peel” effect. Its formula rich in concentrated active ingredients helps reduce the appearance of cellulite to make the skin firmer and more toned. Unsightly pits are eliminated, for a smoother figure. The Crème Amincissante Oxygénante MC110 is an indispensable product for a more refined and balanced figure, and a firmer and smoother skin. It contains a variety of active ingredients to stimulate blood circulation, aid slimming, tone and firm, hydrate, detoxify and regenerate damaged skin. During the winter season, our skin is often neglected, hidden under clothes and generally lacking in regular care. The skin doesn’t take long to react and can easily become dry, dehydrated, dull, flaky or even inflamed, and requires unique care and protection. Luckily, there are plenty of skin products that can help replenish your skin and let it drink up the moisture that was sucked away these past months. After exfoliating and targeting specific body concerns, it is key to moisturise and revitalise the skin. The Emulsion Corps VIP 02 durably hydrates and revives the skin to achieve a soft, silky and luminous skin thanks to its content of hyaluronic acid. It also has oxygenating and anti-free radical active ingredients to soothe irritation, help combat premature ageing and protect the epidermis against daily aggressors such as UV rays. Just what we need to show off our legs! to a full spring beauty overhaul? Visit Beauty M for a personalised and targeted beauty experience that will help you achieve your best self this season. The two locations, Fulham or Clapham, offer a wide range of not only Biologique Recherche face and body treatments but also waxing, tanning, pedicures & manicures.